The Scoop: There are thousands upon thousands of dating sites out there, and that means today’s singles can take their pick and join any niche network that strikes their fancy. However, many singles face anxiety or uncertainty when making their selection. They don’t know which dating sites would suit them best and need more information to make a decision. BikerDatingExpert.com launched to provide educational resources for single bikers in the modern dating scene. This independent comparison site posts up-to-date reviews on the best biker dating platforms available to the public. Its experts give practical, tailored advice geared toward free-spirited bikers looking to ride off into the sunset with someone. Online dating can seem intimidating to singles who haven’t tried it before simply because they don’t know what to expect. Will they encounter spammers? Will there be viable dates in their area? How likely is it that they’ll actually meet someone worth getting to know? These are difficult questions that can stop someone from taking the plunge and signing up to a dating network they don’t know and don’t feel like they can trust. That’s why dating site reviews, like those offered by BikerDatingExpert, can be such an incredible help to both dating brands and consumers. The reviews can highlight the best platforms and direct people to the online environments where they’re likely to find the new friends and date prospects they’re looking for. BikerDatingExpert offers a detailed look at what the online dating world has to offer single bikers. BikerDatingExpert provides expert reviews and dating advice for a niche market in the dating world. This is the place for single bikers wondering where to go, how to act, and what to do to get a date online. BikerDatingExpert.com understands its audience and works hard to provide resources to fix them up with the right tools to satisfy their unique needs. Bikers tend to have big personalities, and so does this consumer-oriented resource. 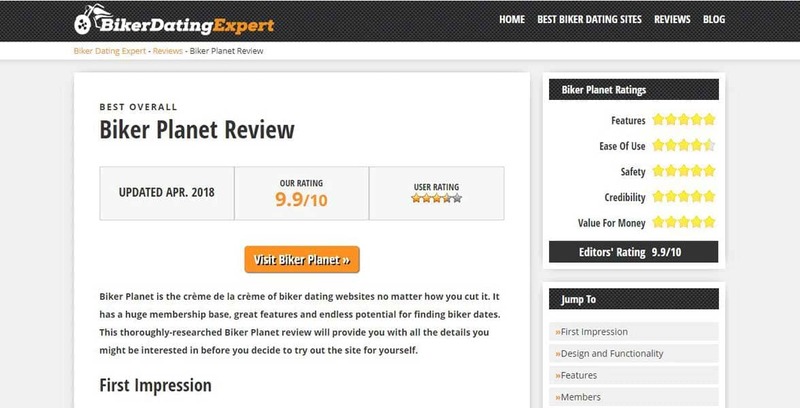 Rather than simply listing dating sites with a simple star rating, BikerDatingExpert actually takes its reviews page a step forward and allows users to filter its list of dating sites by the editor’s top picks, chat rooms, video, IM, and other features. BikerDatingExpert’s unbiased reviews empower daters to confidently navigate niche dating websites. BikerDatingExpert’s team give star ratings based on the platform’s features, ease of use, safety, credibility, and value for money, so singles get the whole picture. Then in the review, the dating expert describes his or her first impression on looking at the site, details its functionality, lists its features, and assesses its members. The closing word section then makes a final argument for why the dating site would be a good place to find a date. At the end of the article, the review really packs a punch and adds credibility to its full review by posting reviews submitted by the users themselves. That way, biker singles can hear what real people think of the dating site and make an informed decision. BikerDatingExpert isn’t just a resource for where to find a date — it’s also a helpful guide on what happens after meeting that special someone. The blog covers a range of topics relevant to those in the biker dating scene. Readers can peruse tips for taking someone on a romantic motorcycle date. They can check out lists of the world’s fastest roadways or most challenging motorcycle roads. If it has to do with biker dating, the BikerDatingExpert team has probably written an article about it. From becoming part of biker culture to learning the do’s and don’ts of biker dating, the blog offers clear, encouraging, and step-by-step guidance for any biker wondering how to act or what to do as they cruise for dates. BikerDatingExpert’s articles thoughtfully explore various aspects of being a biker as well as being single. The writer sometimes draws from his own personal experiences as a biker to explain what it’s like to belong to this unique, passionate community. It’s easy to put the pedal to the metal in the online dating world when you know where to go and what to do to find success. When singles have access to dating site reviews, they can feel more confident about their choice of dating site. BikerDatingExperts lets singles know what they can expect when joining a dating site, and that can often spur newcomers to join up and take a chance on online dating. With its comprehensive reviews, BikerDatingExperts makes it clear what niche dating sites have to offer the biker community. Readers can also get some good tips from the blog, so they can avoid major roadblocks on the way to romance. Some singles may shy away from online dating, thinking it’s not for them, but all it takes is a little encouragement and some helpful knowledge to show them what’s possible. BikerDatingExperts spurs people to sign up for biker dating sites by providing beginner-friendly resources to help them get started.